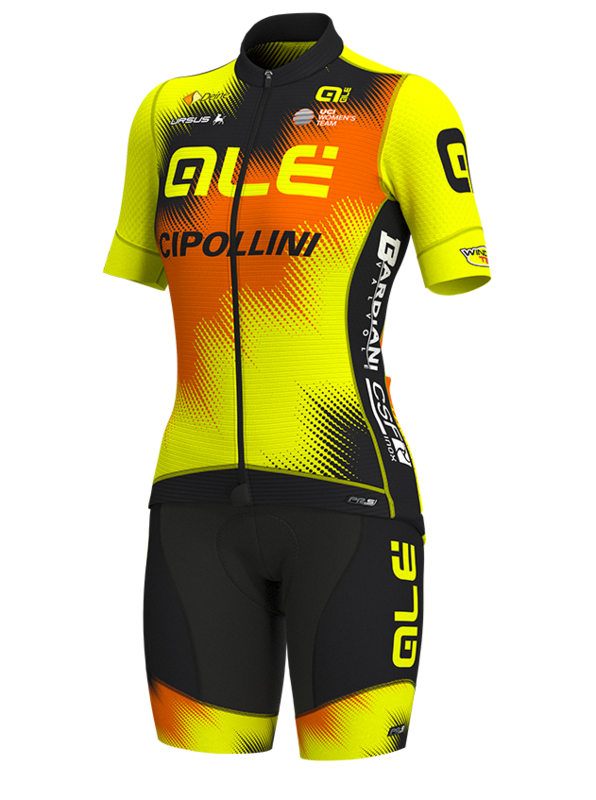 Main sponsor of the team, ALÉ is the brand of a company in Verona with over thirty years experience in the technical bike wear tailoring. At the foundations of ALÉ there is our obsessive Italian craftsmanship, together with the constant innovation in the production process, in materials and in design, to ensure functionality, comfort and the best of performance. The team jersey is part of the PR-System line, designed exclusively for the pro-riders and expression of the vanguard in technical cycling apparel. The jersey has a carbon fiber on the back and a large texture on the sleeves for a better breathability and aerodynamic performance. 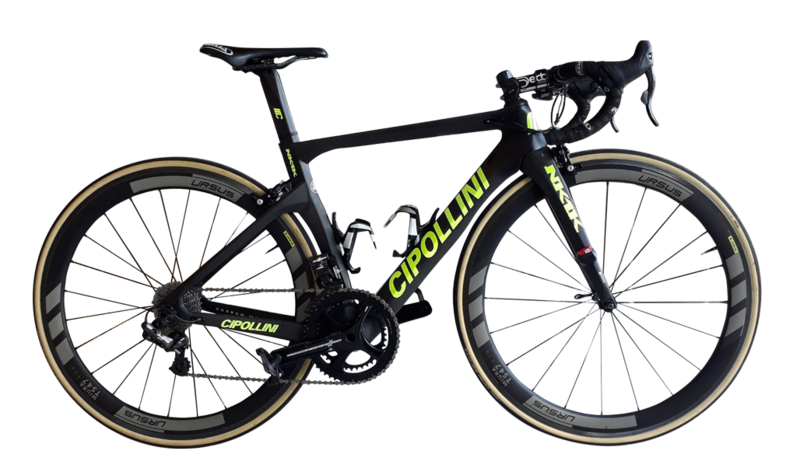 The best weapon of team Yellowfluorange is called Cipollini NK1K. Born for competitions, it’s breath-taking beautiful. An extreme frame for specialists. But despite the appearances, it’s also a comfortable, accurate, safe, easy-to-handle tool. A monocoque “sculpture’’, a road frame with the most innovative technologic know-how, able to express the maximum possible performance in terms of speed. To ensure the perfection the bike is equipped with Ursus Miura TS 37 wheels, Selle Italia saddle, Deda components and Campagnolo groupset. · Upper in multi layer engineered 3D knit with integrated webbing 3mm knit layer in pressure zones. · In Shape, without waste of material, without any type of stitching and gluing. · One dial IP1 BOA®. 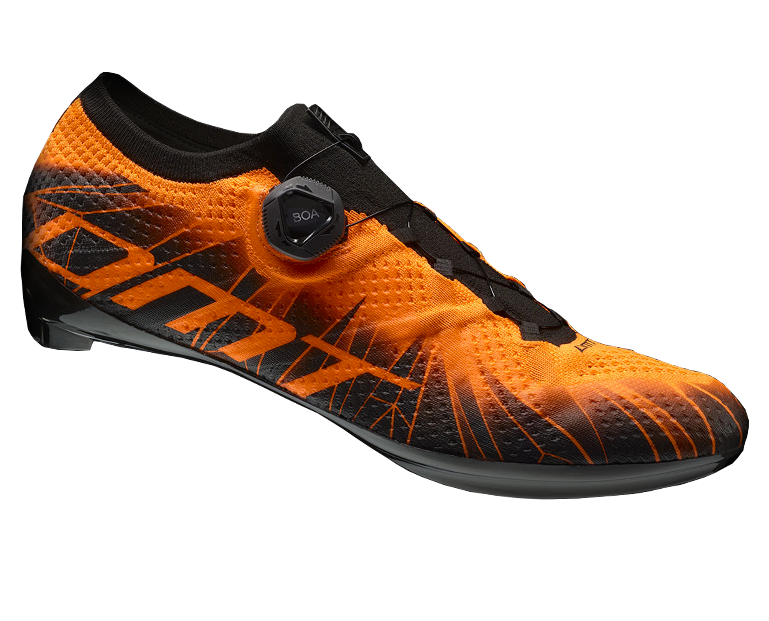 The faster light and precise closure system. · Ankle collar in elastic rib for a perfect and comfortable snug fit. · Anatomic sole construction that follows the natural foot shape for maximum support, comfort and energy transfer. · The Engineered 3D Knit technology makes the KR1 knit extremely light and breathable even during the longest rides.